TMS (Transcranial Magnetic Stimulation) is a technique where neuronal activity can be influenced by non-invasively stimulating the cortex through the intact skull bone. The stimulation is caused by short magnetic pulses, with a field strength similar to a magnetic resonance imaging (MRI) machine. 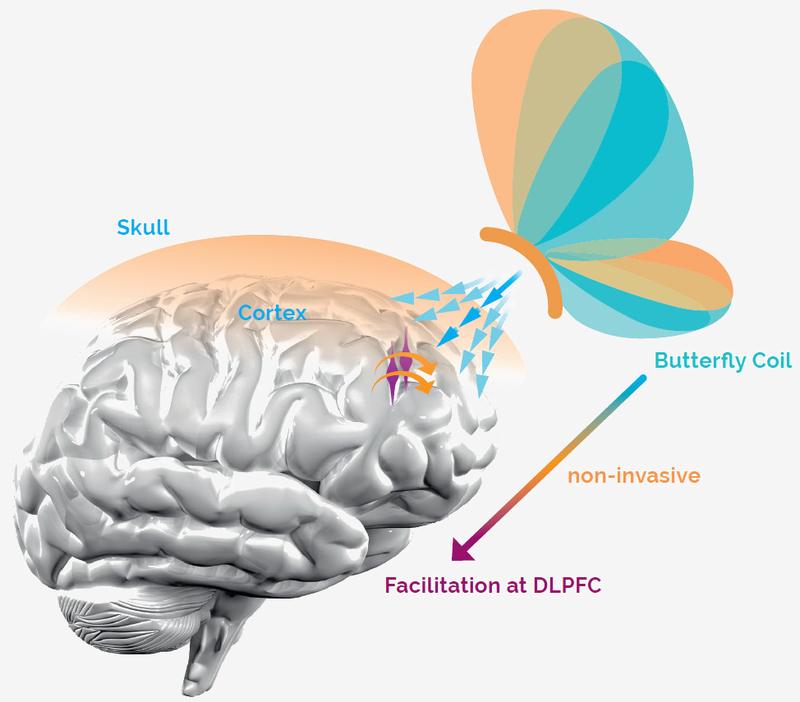 Precise and highly focused magnetic pulses induce a current flow in the targeted cortical brain areas by using easy to move handheld butterfly coils. Depending on the stimulation protocol, neuronal functionalities can be inhibited or facilitated for a defined period of time. Repetitive TMS, also known as rTMS, may produce longer-lasting changes in electro-cortical functionalities. Overactive or inhibited (e.g. depression) areas of the brain can be focally modulated with TMS by applying rTMS over a certain period of time. TMS in general is a safe* alternative therapy for patients who do not benefit from or tolerate other treatment options. TMS is accepted as an evidence-based treatment option by the American Psychiatric Association (APA), the Canadian Network for Mood and Anxiety Treatments (CANMAT), and the World Federation of Societies of Biological Psychiatry (WFSBP). TMS treatment has been approved by FDA since 2008 for patients with depression who have failed to archieve satisfactory improvement from one prior antidepressant medication at or above the minimal effective dose and duration in the current episode. Approximately 1 out of 2 patients experienced significant improvement in depression symptoms. Approximately 1 out of 3 patients experienced complete symptom relief after the full TMS therapy. Apollo TMS Therapy for treatment of MDD takes 19 to 37 minutes per session and is applied while the patient is awake and alert. The sessions will be repeated 5 times a week over 4-6 weeks in total. Apollo TMS Therapy is an in-office treatment. Normal activities are possible after the treatment sessions.